I can’t wait to tell you about a few home improvement and decorating projects that I’ll finally be tackling this month. I set myself up with hard deadlines which I needed as the kick in the pants to get started. It’s about time, right? I’ve experienced a slight setback health-wise. Nothing major but I’ll share a bit later in this post. We’ve taken this as a sign to indulge in the “fun” side of life, seeing some local theater, going to festivals and catching up with old and making new friends. This is a promise I made to myself when we moved here, this house represents a much needed lifestyle change, and we are holding ourselves to it! Foyer with 9.5′ ceilings. I’m contemplating board & batten in this area and maybe dark floors. The existing foyer is formal which I actually like. 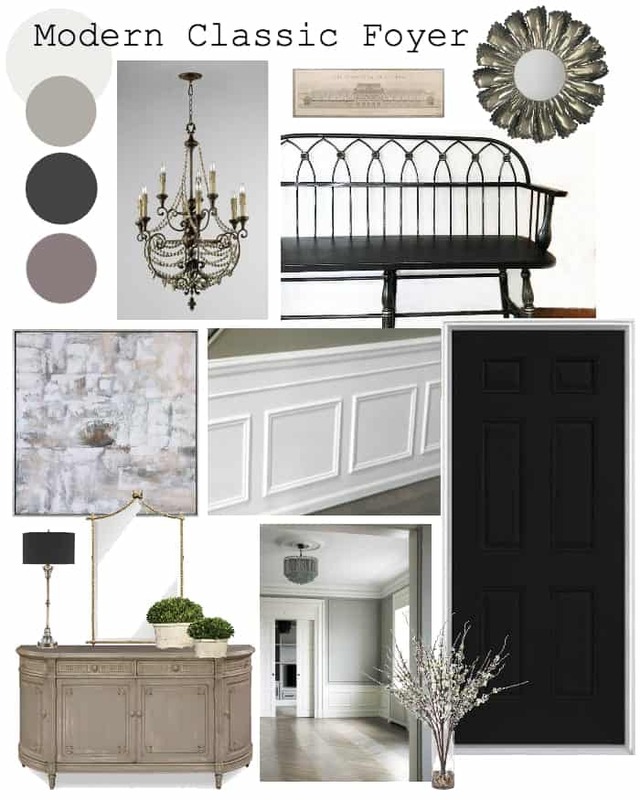 We’ve always loved lots of trim and architectural elements. But the round columns just aren’t me, so we are editing them just a bit and plan to square-off the columns and add raised panels. It’s a bigger job than it looks since these are load-bearing so we will save that for later. But my hope is that I can change the rest of the foyer first by mixing in more casual elements to give it a fresh, modern-classic look. Here’s the initial plan for the foyer. I only have the bench in my furniture inventory. Everything else we will salvage, make or buy. 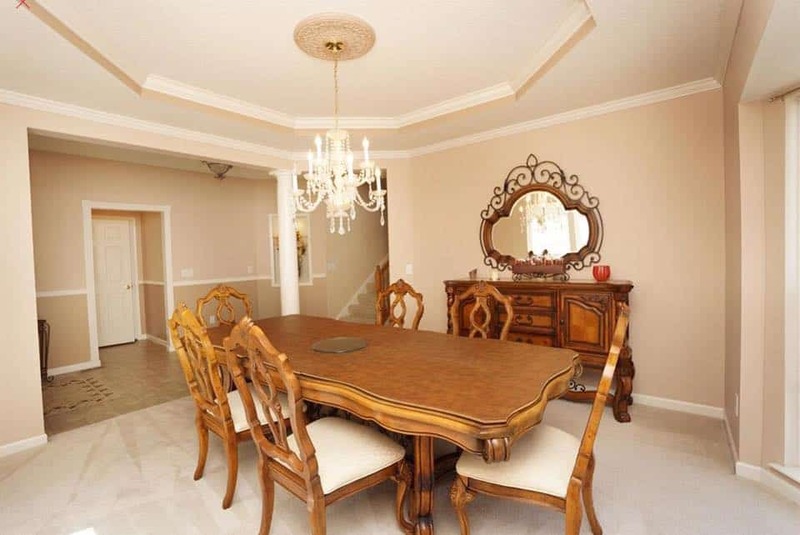 Our dining room is to the right of the foyer when you walk in, and it currently sits empty with no furniture. Below is the listing photo. A coat of paint is about all we will muster at the moment. Dining with trayed ceiling. May change the columns to squared columns. What do you think? It’s kind of fun starting from scratch! 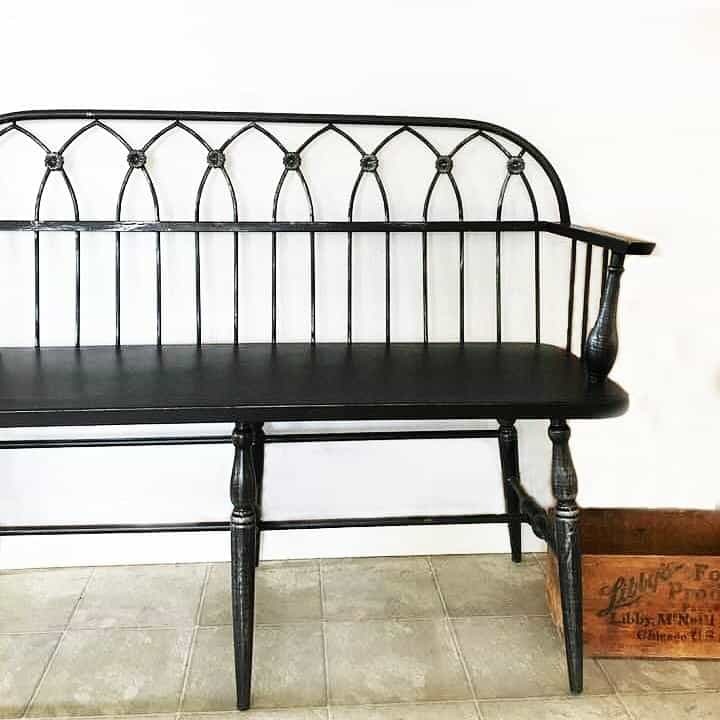 I found this pretty, metal bench at Tuesday Morning and snagged it. I cannot find a link since it was in a clearance outlet but once I do I will share it. I think it sets the tone for our foyer makeover, don’t you? carpal tunnel? // unfortunately I had to quit painting and typing for awhile. I’m pretty sure I’m developing carpal tunnel syndrome, I’m experiencing a lot of pain and numbness in my right hand. To be safe I hired a professional painter to save myself the trouble and the pain. The last house paint job did me in when we were getting it ready to list…so I’m giving myself a break. So this explains why I’ve slowed down lately. Just trying to see if this is a permanent situation or just temporary pain and numbness from the marathon of getting our house ready to sell. choosing paint // We are making some final decisions and choosing our paint colors these next couple of days, so I hope it all turns out the way we are envisioning it. I will attempt to paint the interior doors black, like our old house. I’m hoping a fresh coat of paint is the motivation I need to start decorating again. Our blog growth seemed to explode (thanks Pinterest! 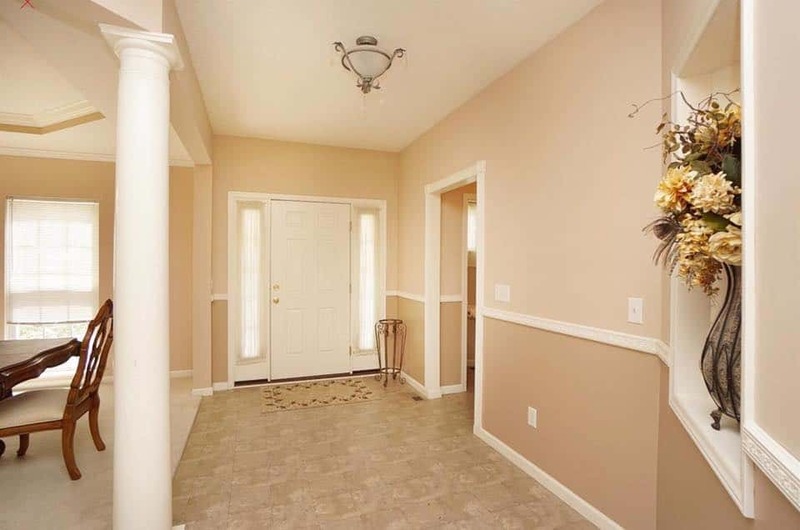 ), after I posted this photos years ago of our wall trim and wainscoting project. At the time I wasn’t thinking this project was anything special. It turns out this diagram was what many people needed to figure out how to DIY their own wall trim, and I answered so many questions over the years. This time we plan to be more thorough and document our progress in realtime. We may even host a Facebook Live video Q&A session to help you visualize the process and learn from our mistakes. More to come on that…we aren’t sure on the timing yet. But we definitely want to help you understand the process and how to choose the right trim that complements your home. Hi! I’m really looking forward to seeing the changes you have planned! Very exciting to have a new space to design. I am really admiring the paint colours you have chosen! Will be phenomenal!! Sorry you have Carpal Tunnel 😢 hope you can find relief quickly. I’d love to see how you decide what style trim will compliment my home. I live in a 1990’s ranch style home with golden oak hardwood floor in the entry hall and walnut brown wood door. I love your design in your previous home and wonder what would really compliment my rather nondescript home. We like to stick with a simpler colonial style trim. I’ll be sharing more pictures soon of what we chose. A big project is in the works! It is so fun to see your home improvements. I have always admired your choices and talent! I hope your carpal tunnel situation is only temporary. Love your posts!